Most aesthetic laser systems deliver short pulses of energy in the form of photons, either visible or infrared (invisible) light. 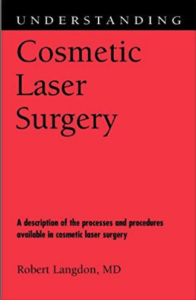 High intensity pulses of laser light of specific wavelengths (color) can safely improve sun-damaged, aged or scarred skin without causing side effects. The higher the laser energy and the shorter the duration of the laser pulse, the greater the precision of the revitalizing effect. It is important that the laser pulse be delivered in an ultra-short burst of energy to ensure a safe treatment. 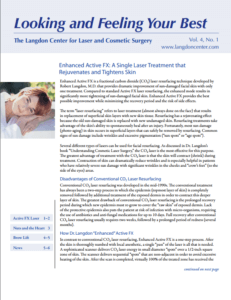 Dr. Langdon was one of the first physicians in the United States to introduce the revolutionary PicoSure laser, the world’s first picosecond aesthetic laser. The high-energy laser pulses from the PicoSure are compressed into the ultrashort picosecond range (a picosecond is 1 trillionth of a second! )—20 times faster than the previous record-setting nanosecond lasers. What Are PicoSure Laser Treatments Like? When delivered to the skin with a special FOCUS lens array, the laser energy is fractionated into tiny spots of intense power that are too brief to impart a significant heat effect. The tiny spots of the skin that receive the laser energy are separated from each other so that the intervening areas of skin are not treated. The limited overall heating of the skin results in a comfortable treatment that requires no anesthetic (numbing) beforehand. After a facial treatment, there is only mild redness that fades completely within a few hours. The best news of all is that patients can see remarkable improvement after only a few treatments. Dark, pigmented sunspots and even melasma (dark areas of facial skin that result from excess estrogen hormone) quickly fade. Wrinkles and even acne scars show significant smoothing. The wavelength of PicoSure laser energy (755 nanometers) is optimal for reducing excessive skin pigment. This wavelength of light is highly absorbed by melanin (the skin’s pigment), resulting in destruction of excess pigment. Another important effect of picosecond laser energy pulses is stimulation of deeper skin cells to produce new collagen. Collagen is the skin’s primary structural protein; increased collagen will improve skin texture by smoothing wrinkles as well as indented scars. The improvement in acne scars from PicoSure treatments with the special FOCUS lens array (fractional treatment) is so impressive that the FDA approved the laser for treating acne scars in July 2014. In FDA approval studies, 86% of patients were satisfied with the improvement in their acne scars from PicoSure laser treatments. Call 203-745-0340 to learn more about PicoSure laser treatments today.